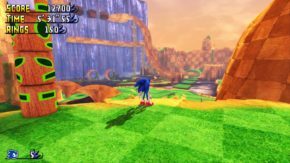 Sonic Utopia – With the advent of 3D engines like Unreal, Unity and others, it would appear we are finally starting to see more fan game creators experiment with Sonic the Hedgehog in 3D. Sonic Utopia has been the buzz of SAGE since it was revealed last night. Control-wise, it’s pretty interesting — Sonic maintains a sense of weight without feeling too heavy or out of control. The main issues I take with something like this are, for starters, level design. When making a Sonic level in 3D, a lot of people seem keen to replicate the sprawling worlds of Sonic 3 & Knuckles. But even dating as far back to Streak Thunderstorm’s unfinished Green Hill Zone map for BlitzSonic, levels of that size and complexity translated directly in to 3D start to feel like mazes. Utopia does its best not to box you in or turn you around too much, with a simple open-air design, but if you lack a good sense of direction then you’ll eventually end up confused as to where to go next. I’m not entirely sure this is the 3D Sonic game I’ve always dreamt about, but it’s still an interesting take, and worth checking out. 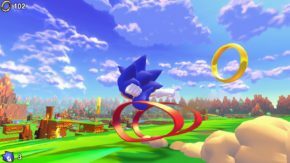 Green Hill Paradise Act 2 Final Mix – Whereas Sonic Utopia does its best not to box you in, Green Hill Paradise does not seem to care, with a huge, intricate 3D world to get lost in. Deep valleys lost in shadow await you, and it’s easy to spend upwards of a half an hour working your way through this one environment. Final Mix actually tries to address this somewhat, and the level in general feels a little less open compared to the previous release and a little more focused on funneling you towards the end of the stage. There’s still tons of room to explore, but it’s much harder to stumble off the beaten path. Final Mix features other changes as well, but I hesitate to call them improvements. Chief among those are new enemy types, pulled straight out of Sonic 3 & Knuckles. If you felt like the enemies in the original release of Act 2 were too small, know that the butterflies from Mushroom Hill Zone now make an appearance, and they are basically impossible to see. For as overwhelmingly complicated as the original release of Act 2 felt, it at least felt very well-considered. Many of the changes made to Final Mix feel too knee-jerk reactionary and it lowers the level’s overall sense of polish. It bums me out to say this, but I think the original release of Act 2 might have actually been a better overall level. 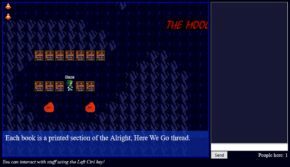 Moogle Cavern: The Online RPG – I wonder, for how many people does this conjure the memories I have of this place? The Moogle Cavern was, for the longest time, my “home” on the internet. Before the days of Twitter, Facebook, or even MySpace, really, The Moogle Cavern was where I hung out. It’s where most of my friends were (the rest were at Sonic Fan Games HQ, though many posted at both places). This, right here, is a slice of history. Unfortunately, in saving this for the last day, I appear to have missed the boat on chatting with other users. What remains is a tiny museum of the place where I had my slow, labored ascension from “child” to “man child.” Thanks for the memories, everyone. Sonic & Friends 2 – Speaking of feeling out of time, here’s a fan game that feels like it fell out of two decades ago, with scratchy WAV sound effects and the cheap, tinny sound of MIDI music. It took me a while to remember, but I’m pretty sure I reviewed the original Sonic & Friends for SAGE a few years ago. The game itself is competent enough, though there are a lot of things about it that feel slightly off in the control department. I’d be willing to forgive those, but the level design here unfortunately isn’t very good. 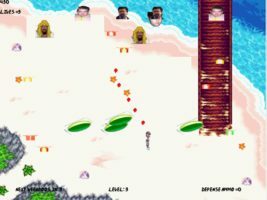 Enemies move in erratic patterns and are often placed directly in front of the player, meaning you bump in to them by accident a lot. I also got stuck for nearly ten minutes at the start of the second level, as the way forward through the level was deliberately obscured until I figured out the solution purely by accident (there are platforms hidden off screen in a place that it looks like you shouldn’t be able to get to) — and I’m still not even sure if that’s how you were supposed to progress forward in the level. Sonic: Round 7 – I feel like I woke up in an alternate universe where I made a fan game about Sonic CD’s special stages. There are a lot of hallmarks in this game of things that I feel like I tend to do, and yet, I don’t think I made this game. An alternate take: When I was younger I often wondered why Sega just didn’t make whole entire games out of the “engine” used to make Sonic special stages. 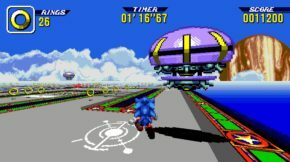 I imagined entire worlds taking place on Sonic 3 & Knuckles’ rotating planetoids, as if it was the easiest thing in the world to plug level graphics in to that system. Round 7 doesn’t quite fulfill that childhood daydream, but it does end up a heck of a lot of fun. 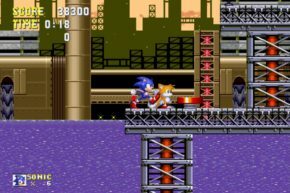 Part of that is due to the fact that collision detection here appears to be much more forgiving than Sonic CD’s special stages, and the controls in general are all around better. I did not expect this to be anywhere near as good as it is, and I’ve never been happier to be proven wrong. Weeaboo Invaders – I wasn’t looking forward to this one and I can honestly say without hesitation that this is a game to be avoided. Earlier I put forth a theory that entries from RAGE were leaking in to the main booth listing, and more than any other game at SAGE, this feels like the strongest evidence of that happening. This is a bad game. It doesn’t control well, it doesn’t play well, it doesn’t have good graphics, and its aesthetic is demeaning and childish. If it’s just a joke, I’m not laughing. Instead, it just feels like a waste of hard drive space, and a waste of effort from its creator. It is wholly unconstructive on just about every single possible level. Please, next time, put a little more care and effort in to making a game. SonicGDK and Sonic Worlds Delta – I’m combining these last two entries because there’s not much to say about them that hasn’t already been said for two or three other SAGEs. That’s not a complaint in any way shape or form; I think it’s necessary to have these at SAGE for every single year they are relevant. If you’ve ever wanted to make your own Sonic games but are scared by the mountain of learning required, these two could be good places to start. You’ll still have to do a lot of learning; neither of these is as simple as, say, Super Mario Maker, but as far as figuring out character physics, movement, etc. (aka “the hardest stuff”) these two projects have you covered. 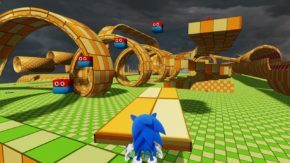 SonicGDK uses Unreal Engine 3 and lets you make 3D Sonic games, whereas Sonic Worlds Delta uses Clickteam Fusion and lets you make 2D Sonic games. I have personally put my own blood and sweat in to Sonic Worlds Delta, helping them improve the gameplay mechanics of Shadow the Hedgehog, who plays like Modern Sonic. SonicGDK is free for anyone to use, whereas Clickteam Fusion is paid software. Hopefully you picked it up on the cheap a few weeks ago when they did the Clickteam Fusion Humble Bundle. And that’s it from me! The way it sounds, the expo will remain open until sometime tomorrow, so if you’ve missed anything, now’s your chance to download them.